Anyone interested in posting an internship/job opportunity on this webpage should e-mail jobsinternships@seas.ucla.edu. All Industrial Affiliates and other company employers are also encouraged to post their current job/internship opportunities on UCLA BruinView through the Career Center. The IE I position requires a 4 year degree in Industrial Engineering or related engineering discipline. The IE I must have excellent computer skills including all MS Office applications. Experience with AutoCAD is desirable. If interested, please submit your resume to careers@farmerjohn.com with the name of the position entered in the subject. Candidate should have an Ed.D. or Ph.D. in Education, Computer Science, Human-Computer Interaction, Statistics, Psychology, Sociology or a related field. The Data Scientist/Learning Applications Researcher draws on her/his prior professional experience to invent, manage, and assess a range of new functions and services as part of the overall research program designed to create a rich environment for self-directed and social learning in the library and beyond. Please submit a resume and cover letter to edlabjobs@tc.columbia.edu if interested. Candidate should have BS/BA in Computer Science or related degree. The Software Architect will design and develop systems and ensure that systems are effectively integrated with current and new applications. Responsibilities include analyzing system requirements, architect, and implement solutions focused on security, maintainability, scalability and high availability. Please submit a resume and cover letter to edlabjobs@tc.columbia.edu if interested. This is a great opportunity for undergraduate and graduate students, along with recent master’s and doctoral graduates, to participate in energy related research. ORISE directly supports DOE’s national agenda to advance science education and research programs by creating opportunities for collaboration through partnerships with DOE facilities, other federal agencies, the academic community and industry. Apply on their website. Candidate should have BS in Civil Engineering. The candidate shall have tasks which include; preparation and implementation of the Source Inspection Quality Management Plan (SIQMP), preparation and implementation of the Quality Management Plan (QMP), completion of QA material inspection reports, submittal reviewal, Quality Control Plans (QCP) reviewal, performance of facility audits, inspection verification, material engineering, and failure analysis. Submit your resume to ZTC via email at info@ztcgrp.com. UCLA undergraduate and graduate students in the sciences, engineering, and the health sciences are eligible to apply for the JRI Summer Research Program featuring a 2‐week language course at Shanghai Jiao Tong University in Shanghai, China followed by 10 weeks at Peking University in Beijing, China where each student teams up with PKU faculty and graduate student mentor to work on a jointly designed project. Throughout the week students take Chinese language and cultural classes. On weekends and evenings, students also have the opportunity to go sightseeing in and around Beijing. Twelve scholarships will be award for up to $4,000 each. Visit http://www.pku-jri.ucla.edu/jri/article/167884 for more information or contact Erin Hakim, hakim@international.ucla.edu. Candidate should have BS or MS degree in a relevant field, such as electrical engineering, mathematics, or physics. The U.S. Department of Homeland Security (DHS) Science and Technology Directorate Office of University Programs sponsors a 10-week summer internship program for students majoring in homeland security related science, technology, engineering and mathematics (HS-STEM) disciplines. Undergraduate students receive a $6,000 stipend plus travel expenses. Graduate students receive a $7,000 stipend plus travel expenses. More info at http://www.orau.gov/dhseducation/internships/. Apply at https://www.zintellect.com/Posting/Details/2595. Direct questions to dhsed@orau.org. Job Duties include guiding 6-to-19-year-old kids through programming curricula and mastering Functional Programming. Applicants should have completed degree. Apply at https://ucode.workable.com/jobs/241553. The Toshiba-Westinghouse Undergraduate Fellows Program is a 10-week paid summer program that provides an unparalleled opportunity for undergraduates to obtain hands-on research experience and professional development in the nuclear field at Penn State. Students will work closely with a faculty mentor on a state-of-the-art nuclear research project, and will have terrific opportunities to network with industry representatives and participate in site visits to locations such as Three Mile Island. The program runs from May 30—August 4, 2017. Find more info at www.mne.psu.edu/twfp. Direct questions to Lori Miraldi at TWFP@psu.edu. Hacker Expo will give you the chance to show off your projects to the UCLA community. Facebook Engineers will award prizes to the best teams. The selection process consists of this application and one interview. Apply to demo your project at http://www.tinyurl.com/hackexpo16. Contact support@hackucla.com if interested. True Ventures is recruiting for a pair of fellowship programs—one a summer experience for rising juniors and seniors, and one a yearlong program for recent graduates. The first program, The True Entrepreneur Corps (TEC), is a ten week Summer 2017 fellowship designed to help college students get a foot in the door in the startup world. TEC Fellows are matched with San Francisco-based companies in our 125+ company portfolio where they spend the summer working on projects appropriate to their backgrounds and interests. The second program, The Priya Haji Fellowship, is similar in intent and design to TEC. It runs for the entire 2017-2018 academic year and gives recent graduates the chance to join a startup as a full-time employee.
. Pay rate is $15/hr, start date is after December 9. Earth and Planetary Sciences at Northwestern University supports all their PhD students with a competitive $30k/year living stipend, in addition to full tuition and medical insurance. Visit http://www.earth.northwestern.edu/ or click on the faculty fliers in the attachment. – Posting items on social media news sites such as Twitter, Facebook, Linked in, etc. – Designing and maintaining web sites for periodic events. – Technical skills include html and various other web site development skills. Boeing Site Services is seeking candidates interested in facilities related careers for a number of Internship positions in Project Administrator, Construction Management, Facilities Engineer, Facilities Planner, and Facilities Analyst positions for Summer 2017. Please see the attached flyers for details. Rajit Gadh’s lab is looking for a student to help with lab and office management activities. This includes keep track of calendaring, doing scheduling, assisting with lab operations, helping with report editing, powerpoint editing, MS word document editing, booking events, assisting at workshops, etc. This is a paid position and salary will depend upon experience. Estimated 7-15 hours/week. If interested, email info@smartgrid.ucla.edu. Energy Solutions is looking to fill an Energy Efficiency Project Manager II position in their Orange office. As a member of the Energy Solutions team, you will have a broad impact on energy efficiency markets and greenhouse gas reductions. Candidates should have 5 years of combined graduate school and relevant professional work experience and a degree in an energy-related discipline including engineering, environmental policy, business or natural resources. Responsibilities include overall direction and management, quality control, completion of project and project staff deliverables, monitoring progress of projects and communicating progress to management and clients from project inception to completion. If interested, email a cover letter with your available start date and your resume to jobs@energy-solution.com. Candidate should have a minimum of two years of work experience and/or graduate school a technical degree in an energy-related discipline with environmental, electrical or mechanical engineering. As a member of the Southern California Team work on programs that incentivize the adoption of advanced, energy efficient HVAC, lighting, Demand Response, and related technologies. Responsibilities include overall direction, management, quality control, completion of project deliverables, and managing project budgets and tasks with minimal oversight. To apply, visit https://energy-solution.com/company/careers/. The Department of Mechanical Engineering at the University of California, Santa Barbara invites applications for two full-time faculty positions with an anticipated start date of July 1, 2017, or later. The Department is looking for exceptional individuals in all core areas of Mechanical Engineering with particular emphasis in fluid mechanics (tenure-track Assistant Professor), and micro and nanoscale thermal sciences and their application to energy systems (tenure-track Assistant Professor or tenured Associate Professor). Responsibilities include teaching at the undergraduate and graduate levels, recruitment and supervision of graduate students, and the development of an actively funded research program of the highest quality. Applicants must have a Ph.D. or equivalent degree in Mechanical Engineering or a related field by the time of employment. Applications received by Friday December 9th, 2016, will be given priority consideration. Please follow instructions on flyer to apply. UCLA undergraduate and graduate students in the sciences, engineering, and the health sciences are eligible to apply for the JRI Summer Research Program featuring a 2‐week language course at Shanghai Jiao Tong University in Shanghai, China followed by 10 weeks at Peking University in Beijing, China where each student teams up with PKU faculty and graduate student mentor to work on a jointly designed project.To learn more about the program and how to apply, please visit the JRI website. The deadline for applications is Friday, February 3, 2017. Contact Erin Hakim at hakim@international.ucla.edu. The EnCorps STEM Teachers Program empowers STEM industry experts to become exceptional teachers, tutors, and educators. Apply online between August 1 and May 16 at http://encorps.org/apply. The internship is intended for college juniors or seniors and graduate students. The intern will be involved in the implementation and test of the thermal energy generator. Specific tasks include: (1) high pressure hydraulic tubing (e.g., cutting, bending, fitting), (2) assembly of mechanical components, (3) laboratory testing of prototypes, and (4) recording and tracking of various test data. If interested, send resume and statement of interests to yi@seatrec.com. Blizzard Entertainment has opportunities for new grads and internships in Summer 2017. Check flyer or visit website for more information. The Marcus Autism Center, in conjunction with the Emory University School of Medicine and Children’s Healthcare of Atlanta, is offering four fellowships: the Simons Fellowship in Computational Neuroscience, the Marcus Fellowship in Speech Science and Engineering, the Cohen Fellowship in Developmental Social Neuroscience, and the Simons Fellowship in Design Engineering. Students who will receive a bachelor’s degree by June 2017 will be eligible for the positions. The fellowships will commence in July 2017, and they are 2 years in duration. Students can find further details at: simonsfellowship.org and cohenfellowship.org. The purpose of the funding program is to provide an incentive for engineering Bachelor’s candidates who have a broad interest in various environmental engineering fields, such as municipal water, wastewater, solid waste, air quality, water resources, hazardous waste, sustainable engineering and energy recovery to pursue a Master’s degree in environmental engineering. Applicant should have recent Bachelor’s degree. Candidate responsibilities include providing basic and/or routine system configuration, workflow documentation, application testing and simple business process analysis in support of the EMR application. This job is in the field of Healthcare Information Technology. Submit your resume to eiscareers@cshs.org with “Associate Application Specialist” in the subject line. Cyclotron Road is a premier fellowship and incubator for early stage hard-tech energy innovators, sponsored by the U.S Department of Energy at Lawrence Berkeley National Labs (LBNL). Applications for Cyclotron Road Cohort 3 are now open. Visit cyclotronroad.org/apply to register your application today. There is an internship presentation by Bain & Company on November 1st, 7:30pm at the Career Center, Second Floor – Room 200. Visit www.joinbain.com/ucla for more information and direct questions to Meghan Loehr, Senior Recruiting Coordinator, at Meghan.Loehr@Bain.com. MindSumo partners with employers to create projects that you can complete to get work experience, win prizes, and be hired for jobs and internships. Topics include “Propose a non-metallic, fatigue-resistant, material for cyclic loading” and “Tell us about a new lubricant, coating, or material to reduce friction.” Questions can be directed to aaron@mindsumo.com. Volunteers get hands-on experience in all steps of designing, building and installing a wind turbine as part of a team. They will learn and gain expertise in such materials and processes as: carbon fiber, fiberglass, resin composites, steel structures and welding, electrical systems, aerodynamics, and much more; all the while getting to experience the life and cultures of Peru. Project Groups are four weeks long, and if you are interested in a more immersive program they offer a limited number of Long-Term Volunteer opportunities. In 2017 we are offering projects year-round and rolling application deadlines, with projects limited to eight volunteers. These programs are designed to bring together premier employers with our brightest undergraduate students. Successful candidates will benefit from alumni mentorship and help connecting you with an internship in an industry of your interest. This fellowship is intended for juniors who expect to graduate between December 2017 and June 2018. Incoming transfer students, sophomores who will graduate early are eligible to apply. Priority deadline is September 14, and final deadline is September 28. To apply visit http://partnershipucla.submittable.com/submit. DEVELOP projects apply Earth observations and remote-sensing technology to application areas that highlight NASA Earth observation capabilities relative to environmental issues for enhanced policy and decision making. Anyone 18 and over, who is interested in pursuing experience in the Earth sciences and remote sensing, is welcome to apply. The program takes place January 23, 2017 – March 31, 2017. Applications accepted online August 29, 2016 – October 7, 2016. Apply online at http://develop.larc.nasa.gov/apply.php. As Fall quarter approaches, Deloitte Consulting is gearing up for another great recruiting season! During this Fall recruiting season our Human Capital service area will be recruiting Juniors for internship positions and our Technology and Strategy & Operations service areas will be recruiting Seniors for full-time positions. Our consultants are excited to meet each and every one of you. Kindly make note of these upcoming deadlines and events, and ensure that your application is submitted both to BruinView and careers.deloitte.com by October 7th at 11:59pm. Faculty, postdocs, and graduate students are invited to a lunch&learn session on technology commercialization NSF grant! RSVP to Azar Nazeri at anazeri@ucla.edu by September 23, 5pm. Lunch will be provided! What: National Science Foundation Innovation Corps (I-Corps) methods of accelerating the transfer of university engineering/life sciences research to the marketplace. You can find out more information about the competition on the Mathematics Department website (http://www.math.ucla.edu/ugrad/putnam-competition). If you have any detailed questions (i.e., subject tested, qualification, etc. ), you can contact Professor Ciprian Manolescu (cm@math.ucla.edu). The deadline to sign up is Friday, September 30. To sign up follow this link: https://docs.google.com/forms/d/e/1FAIpQLScRpJoyQBF-Monh26RQLqYgcfXp40-hItXIpLcgZDrshjX8aA/viewform?c=0&w=1. We encourage you to consider participating in this year’s competition, which will be held on Saturday, December 3, 2016. This is a full-time Fellowship looking to help academics to transition to jobs at companies in the industry in full-time roles. It is a 7 week, full-time, post-graduate training Fellowship in fields such as Data Science, Health Data Science, and Data Engineering. Apply at their respective websites. If you have questions, email info@insightdatascience.com. Major in a quantitative discipline such as Economics, Finance, Industrial Engineering, Electrical Engineering, Computer Science, Operations Research, Mathematics, Physics, or Statistics preferred. Columbia Business School seeks to recruit a full-time Research Associate (RAs) to assist with faculty research in the following divisions: Accounting; Decision, Risk & Operations (DRO); Finance & Economics (F&E), Management, and Marketing. Duties include developing and implement models and simulations in Matlab, R, C++, Python, STATA, SAS etc. Please fill visit our website and fill out the application at http://bit.ly/CBS-researchassociate and email your resume, cover letter, and transcripts via email to researchjobs@gsb.columbia.edu. The Technical Sales Development Program is your opportunity to gain the training necessary to become an entry-level, direct sales professional. Sales Associates enter a program consisting of classroom training, on-the-job learning, and mentorship. After successful completion of the Sales Associate classroom training, you will be promoted to Sales Engineer, initiating the on-the-job training phase of the development program. Here is how you can apply. Candidate will assist with the Analysis, Design, Development, Testing and Documentation of new software solutions. Applicant should have functional background in Software Engineering/Computer Science or similar discipline. Contact sheabahnsen@gmail.com if interested. Student Engineers will assist Engineers/Architects in the preparation of plans and specifications for projects involving grading, paving, storm drain systems, sewer systems, roadways, buildings, wharves, transportation studies, marine facilities, and other miscellaneous engineering duties. Other duties will include making copies, scanning documents, processing shop drawings and record drawings, preparing plans for permits, and coordinating with other agencies. Candidates must be of at least sophomore standing and have working knowledge of CAD. Send resume by Friday, October 14, 2016 to Mr. Marco Sanchez, Engineering Division at msanchez@portla.org. Deloitte is specifically seeking candidates for its Life Sciences Technology Consulting practice. As part of this practice, you will serve Deloitte’s life science and healthcare clients by providing strategic advice on how technology can support their business strategy and operational goals. Apply at the infosession and go on Bruinview. Supply is a YC startup developing wireless charging technology. They’re hiring an Embedded Engineer to join their team and develop firmware for their wireless charging networks. Applicants should be familiar with C and C++ for microcontrollers. Visit https://angel.co/supply/jobs?utm_source=profile_module for more information. Astraeus Aerial is looking for a mechanical engineer intern to assist with the development, design, and prototyping of sUAS components and systems utilized in their motion picture industry image-capture operations. You will take ownership of components and subsystems used in the products Astraeus develops for this exciting new realm. You’ll have the opportunity to create, fabricate, integrate and test hardware and systems, and be part of a team that is dedicated to creating groundbreaking remote piloted vehicle solutions. Contact Hal Winer hal@astraeusaerial.com if interested. The incumbent shall assist Regional Board staff with the review of analytical soil and groundwater data. The incumbent shall assist in coordinating file reviews and public record requests with engineering consulting firms, legal professionals, and the general public. The incumbent shall assist Regional Board staff with case file management and mail-outs. Application can be found here. As a member of the deep learning team, you will design, develop, configure and optimize deep neural networks for various tasks such as detection and classification. Candidate should have PhD, M.Sc. in Computer Science, Electrical Engineering or Econometrics, and high proficiency in C++, Python and/or Java. Send requested material to careers@oben.me. Engineer will build, improve and extend NLP capabilities, and research and evaluate new/different approaches to NLP problems. Candidate should have MSc./PhD in Computer Science, Computational Linguistics or related fields, and have strong Machine Learning background and familiarity with R, WEKA, RapidMiner, etc. Send requested material to careers@oben.me. iOS Developer will be responsible for working closely with our design/UI/UX team and developing the iOS app which will manage the natural human interfaces for robotics. Candidate should be hackathon expert with deep customer empathy and ability to quickly translate insights, whiteboard sessions, napkin sketches and water cooler talks into mockups, wireframes, and working proof-of-concept code. Send requested material to careers@oben.me. Engineer will collaborate with senior machine learning researchers, engineers and speech processing researchers to lead the build of build consumer applications and prototypes which incorporate key technologies developed in-house. Send requested material to careers@oben.me. Job: Oben – Machine Learning Scientist with Audio DSP background Candidate will collaborate with senior machine learning researchers, engineers and speech processing researchers to provide technical expertise to address supervised and unsupervised learning problems in an applied research and development environment. Candidate should have doctorate or Masters degree in Computer Science, Mathematics, Applied Physics, Applied Statistics or in Engineering. Send requested material to careers@oben.me. Job: Oben – Machine Learning Engineer As a member of the machine language translation team, you utilize your superior technical aptitude and deep understanding of Machine Learning and Natural Language Processing to create the best Machine Translation solutions for our algorithms. Candidate should have PhD, M.Sc. in Computer Science, Electrical Engineering or Physics. Send requested material to careers@oben.me. Job: Oben – Speech Recognition Research Scientist As a Speech Recognition Research Engineer at Oben, you’ll be working on several proprietary and stealthy projects in the audio space. Your work will encompass the whole scope of application development, including speech research, voice interface design, application prototyping, and development of our proprietary speech recognition engine. Candidate should have PhD (Preferred), M.Sc. in Computer Science, Electrical Engineering or Physics. Send requested material to careers@oben.me. Job: Oben – Speech Synthesis Research Scientist This position is concerned with research and development in advanced speech synthesis. The work will have a particular focus on the development of structured acoustic models which take account of factors such as accent and speaking style, and on the development of machine learning techniques for vocoding. Candidate should have PhD (Prefered), M.Sc. in Computer Science or Electrical Engineering. Send requested material to careers@oben.me. Job: Oben – User Experience Designer Candidate will be responsible for executing interaction design and visual design as a part of a multi-disciplinary team, and collaborating on user experience planning with a lead experience architect. Send requested material to careers@oben.me. Job: Oben – Technical Program Manager Join ObEN as a Technical Program Manager and help build innovative applications and custom solutions. You will play a critical role in planning new systems architecture and technical direction for the company’s technology roadmap. Candidate should have BS/MS degree in computer science/EE or equivalent. Send requested material to careers@oben.me. Job: Oben – Director of Engineering Oben is looking for an entrepreneurial leader with a strong technical background that can lead their talented group of developers. Candidate should have BS/MS in Computer Science or equivalent work experience. This role will be responsible for the back-end team and mobile app team. Send requested material to careers@oben.me. Job/Internship: TAG Energy TAG Energy is a privately held sales and consulting firm in Irvine, California. They currently represent Fortune 500 Clients in the telecom, business supply, and solar energy industries. TAG Energy specializes in customer acquisition and retention, leadership and strategic consultation, coaching and developing young professionals, and giving back to the community. Currently, TAG Energy is looking for interns, as well as someone to fill their Account Representative position. Contact HR@tagenergygroup.com if interested. Job: HRL Laboratories – Firmware Engineer Candidate should be US person with Bachelor’s degree in Computer Science, Computer Engineering, or Electrical Engineering. Job responsibilities include development of firmware and design and implement system software solutions to provide a high performance and robust embedded platform to application teams. If interested, contact hdnguyen@hrl.com at Hung Nguyen. Job: HRL Laboratories – Embedded Systems Engineer Candidate should be US person with Bachelor’s or Master’s degree in Computer Science, Computer Engineering, Electrical Engineering, or systems engineering. Candidate will perform on R&D projects in the development of MEMS-enabled electronic systems for next generation aerospace, automotive, and industrial applications. Develop Mathworks Simulink models for control (feedback, phase-locked loops, etc.) and I/O (audio, analog, RF, and digital). If interested, contact hdnguyen@hrl.com at Hung Nguyen. Job: Sandia National Laboratories – R&D Systems Engineer (experienced) Sandia National Laboratories is seeking a Systems Engineer with Masters in electrical engineering or mechanical engineering to lead engineering systems development activities for future Sandia programs and interface with internal and external customers. Candidate will plan, conduct, and execute Sandia’s science and engineering programs within the spectrum of fundamental research, development, or demonstration. Job: Sandia National Laboratories – R&D Systems Engineer (early/mid-career) Sandia National Laboratories is seeking a Systems Engineer with Masters in electrical engineering or mechanical engineering to lead engineering systems development activities for future Sandia programs and interface with internal and external customers. Candidate will plan, conduct, and execute Sandia’s science and engineering programs within the spectrum of fundamental research, development, or demonstration. Job: Sandia National Laboratories – Cybersecurity Analyst (early/mid‐career) Sandia National Laboratories is seeking cybersecurity analysis experts to join our multidisciplinary team of systems analysts, whose studies provide decision insight to customers in ill‐defined or complex multi‐domain problem areas. Candidate will apply critical thinking using a diversity of technical skills and expertise, and effectively communicate options, insights, and trade‐offs to customers in a concise way that enables action. Job: Sandia National Laboratories – Cybersecurity Analyst (experienced) Sandia National Laboratories is seeking cybersecurity analysis experts to join our multidisciplinary team of systems analysts, whose studies provide decision insight to customers in ill‐defined or complex multi‐domain problem areas. Candidate will apply critical thinking using a diversity of technical skills and expertise, and effectively communicate options, insights, and trade‐offs to customers in a concise way that enables action. Job: Sandia National Laboratories – R&D Systems Research Analyst (early/mid-career) Candidate will apply critical thinking using a diversity of technical skills and expertise, and effectively communicate options, insights, and trade‐offs to customers in a concise way that enables action. Candidate will also provide technical depth and insight in particular to analysis problems in the nuclear and radiological security domain, to enable connectivity between operational organizations, and Sandia’s broad and deep research and development teams. Job: Sandia National Laboratories – R&D Systems Research Analyst (experienced) Candidate will apply critical thinking using a diversity of technical skills and expertise, and effectively communicate options, insights, and trade‐offs to customers in a concise way that enables action. Candidate will also provide technical depth and insight in particular to analysis problems in the nuclear and radiological security domain, to enable connectivity between operational organizations, and Sandia’s broad and deep research and development teams. Internship: NASA – DEVELOP National Program (Due: July 1) This is a great opportunity for individuals who are interested in practical applications of remote sensing and GIS, specifically in the field of Earth Science. DEVELOP projects focus on addressing local and international community concerns while utilizing NASA’s Earth observations. Participants work in teams, with guidance from NASA and partner science advisors, to demonstrate to partner organizations how NASA remote sensing imagery can be used in water resources, disaster management, ecological forecasting, and other applications to address environmental community concerns. The fall 2016 online application is open from May 23 – July 1, 2016. The fall 2016 internship dates are September 12, 2016 – November 18, 2016. Contact NASA-DL-DEVELOP@mail.nasa.gov with any questions. Job: ASC Process Systems – Controls Engineer Applicant should have Bachelor’s degree in Engineering (preferably in Electrical, Mechanical or Computer). Candidate will be responsible for the programming, testing, installation, training, and customer interface for field controls jobs. Candidate will also perform in-house commissioning, field commissioning, and customer training of control systems for the installed and validated equipment. Contact elise.riner@aschome.com if interested. Job: ASC Process Systems – Electrical Engineer Applicant should have Bachelor’s degree in Engineering (preferably in Electrical). Candidate will be responsible for the design, development, and in-house testing of electrical systems for turnkey automated custom equipment. Candidate will also design and upgrade electrical systems for custom automated process equipment. Contact elise.riner@aschome.com if interested. Internship: Community Rebuilds Community Rebuilds is a non-profit organization based out of Moab, UT. Their mission is to build energy efficient housing, provide education on sustainability and improve the housing conditions of the workforce through an affordable program. Community Rebuilds’ student education program consists of building two straw bale homes simultaneously from foundation to finish. Interns will learn about natural building including straw bale walls, earthen plasters, adobe floors, solar photovoltaics and permaculture. Visit www.communityrebuilds.org to apply. Job: Experior Laboratories – Jr. Test Engineer They are looking for a Mechanical or Electrical Engineer who will conduct and provide direction for tests and ensure compliance to contractual test requirements through development, validation, and execution of environmental and mechanical tests of fiber optic and electrical components as well as various other types of products and equipment. Candidate will also generate test plans, procedures, and work instructions from customer requirements. Contact John Kim at jkim@experiorlabs.com if interested. Candidate should have Bachelor of Science degree in Manufacturing or Industrial Engineering. Responsibilities include developing, evaluating and improving manufacturing methods, as well as analyzing and planning work force utilization, space requirements, workflow, designs layout of equipment and workspace for maximum efficiency. To apply, send resume and salary history to Jackie Sanchez at Jsanchez@wilburcurtis.com. In this cross-functional role, you will be working with both technical and business teams at all levels of the company to acquire new users and retain existing users. Responsibilities include generating ideas for analysis to shape future projects and developing dashboards and reports to regularly communicate results. Candidate should have BA/BS/MS in Math, Economics, Statistics, Engineering, Computer Science, or other quantitative field. Contact iris@musely.com if interested. Candidate will collaborate with cross-functional teams to define, design, and ship new features in Musely Apps (iOS or Android). Candidate should have BA/BS/MS in Engineering, Computer Science, or other quantitative field, along with experience developing, releasing, and maintaining native iOS or Android applications. Contact iris@musely.com if interested. You will design and implement high-performance RESTful web services serving tens of millions requests a day with a group of enthusiastic engineers. You will build infrastructure crucial to our frontend and backend applications. You will help Musely scale to the next 20 million users and beyond. Candidate should have BA/BS/MS in Engineering, Computer Science, or other quantitative field, along with programming experience in Java or C++. Contact iris@musely.com if interested. Candidate is responsible for researching and providing information on new and current customer inquiries, as well as organizing and conducting sales visits. Candidate will also establish and maintain contacts with customer regarding technical specifications, determining potential needs and follow-up information requirements. Candidate should have BSEE degree or equivalent education and experience. Email resume and cover letter to jobs@daico.com. As a Content Developer at Microsoft, you’ll test out new features, work with engineering and marketing teams, and create awesome documentation. As part of this team, you’ll show IT Professionals how to set up, manage, and keep their Windows devices secure. You’ll get a chance to flex your technical skills by setting up client/server machines and test new features. Like scripting? Help out customers by creating end to end scripts that help solve their problems. Are you a privacy and security champion? Help keep our customers secure and be a part of a world class security team! Contact PICrecruit@microsoft.com. Start date is Summer 2016. One full­time paid position is available for their summer research internship (40 hours per week; 12 weeks) and part­time for Fall/Winter (20 hours per week; 10 weeks) quarters. Candidates will work closely with clinicians, bioinformaticians, and computer scientists in a leading laboratory to research and apply text­mining and statistical methods to discover new insights from clinical data and scientific literature. Candidates should have background in Computer Science, Math, Statistics, or Life Science. Send resume to admin@heartbd2k.orgby June 3, 2016. Kika would like to schedule coffee chats with experienced student brand ambassadors from the above universities that had worked with other brands, preferably apps, for some great suggestions. Candidate will promote Kika’s product and brand on social media channels, and plan and host on-ground events. Interested students please reach out to kikatechsba@gmail.com. Responsibilities include collaborating to plan, develop and implement and track performance of marketing campaigns, and creating content for corporate marketing collateral, website/social media, and other initiatives. Interested candidates please email your resume to nikky@kika.tech. Igor Gastaldello and his company (BSI) is looking to expand the development team and is looking for people to fill up 2 kind of positions one focused on helping developing a java server back end and one for a rest Java-Script front end in angularJS. They are looking and can offer a collaboration on ‘project basis’ with possible career progression. Contact: igor.gastaldello@business-semantics.com or call 323-893-6020. As an intern on the SoC Physical Integration team, you’ll work closely with senior engineers to perform various tasks depending on the stage of the project. Intern will assist senior engineers in the development of design flows and methodologies, and debug test cases to validate flows and methodologies for circuit checking tools. Applicant should have knowledge of and/or experience with design tools such as Virtuoso, and fundamental circuit design knowledge including simulation experience with Spice. Applicant should be a junior pursuing BSEE, recommended pursuing MSEE. Contact Alvin Ching at aching@xilinx.com if interested. The Rabinovici Lab at the UCSF Memory and Aging Center is looking to hire two fulltime research assistants in Spring 2016. This is an ideal job for graduating college students who are interested in neuroscience and are hoping to pursue higher degrees in research or medicine. Two-year commitment is preferred. The Rabinovici Lab studies Alzheimer’s disease and other neurodegenerative diseases using a variety of cutting-edge imaging techniques (PET, MRI, fMRI, DTI). The core of the job involves performing advanced data processing and analysis, collaborating on projects with medical fellows and postdoctoral scholars, and preparing materials for data requests, presentations and papers. Interested candidates should email Daniel Schonhaut at daniel.schonhaut@ucsf.edu with Subject Line: UCSF RA Position. General job duties include handling incoming calls from patients, nurses, and physicians, patient training, and recording and communicating critical patient events to physicians and nurses. If interested, contact hpeckos@intelli-heart.com. For more information, visit www.intelli-heart.com. General job duties include handling incoming calls from facilities, patients, reps, entering data into various databases, verifying insurance and benefits, interfacing with insurance companies, and tracking payment. Applicant should have BA/BS from accredited University. If interested, contact hpeckos@intelli-heart.com. For more information, visit www.intelli-heart.com. Serving as the HR resource for our employees, you will provide support, guidance, and resolution in employee relations matters, employee benefits, basic performance issues, payroll, and policy matters. Applicant should have BA/BS from accredited University. If interested, contact hpeckos@intelli-heart.com. For more information, visit www.intelli-heart.com. General job duties include scanning ECG/EKG, keeping track of equipment and sending out orders, training patients on how to use our equipment, and accurately reporting patient symptoms and creating reports to be reviewed by their physician. Applicant should have BA/BS from accredited University. If interested, contact hpeckos@intelli-heart.com. For more information, visit www.intelli-heart.com. Volunteers will receive hands-on experience in all steps of building and installing a wind turbine as part of a team. They will learn and gain expertise in such materials and processes as: carbon fiber, fiberglass, resin composites, steel structures and welding, electrical systems, aerodynamics, and much more; all the while getting to experience the life and cultures of Peru. Apply at http://www.windaid.org/application-form/ if you are interested. Contact Zoé Serafinowicz at Volunteer@WindAid.org if you have any questions. Candidate must be very proficient in multi-threaded programming with pthreads, including a thorough understanding of locking, synchronization, and race conditions in large highly-parallel programs. Must be familiar with system programming concepts in a Linux or similar environment, such as network sockets, epoll(), fork(), etc. If interested, contact Kalila Stuart at kalilas@cybernetics.com. Intern will provide technical support for a variety of capital and maintenance infrastructure projects that include complex treatment plants, large transmission / distribution water pipelines, groundwater production wells, booster pump stations, large reservoirs, pressure tanks, and automatic control valves. To apply, use reference job number #2016-1753 at www.calwatergroup.com/careers. Bruins Beyond Borders is a new mentorship program from International Students Association (ISA) specifically designed for helping incoming international freshmen transition smoothly into UCLA. Apply to be a mentor at http://bit.ly/b3mentorship. Direct questions to bruinsbeyondborders@gmail.com. As a member of the SoC Physical Integration team, you’ll interface with various engineering groups, including design, CAD, software, and product engineering, across various geographies to work towards the physical verification and tape out of Xilinx SoC FPGAs. Common essential duties and responsibilities include, but are not limited to defining and developing flows and methodologies for chip level integration, and developing tools for design verification or efficiency. If interested, contact Alvin Ching at aching@xilinx.com. Two full­time positions are available for Summer internship (40 hours per week; 12 weeks) and part­time for Fall/Winter (20 hours per week; 10 weeks) quarters. Candidate must have experience with Java or C++ and object oriented programming, and experience with SQL databases. BD2K offer $25 to $35 compensation per hour based on experience. Send resume with a brief description of previous projects to admin@heartbd2k.org by April 29, 2016. Swift Engineering is looking for Mechanical/Aerostructures Intern, Mechanical Intern, and Electrical/Mechatronics Intern. Engineering Intern ensures that a part/product are effectively and successfully realized and design/development projects are effectively and successfully executed. Candidate should be pursuing BS degree in Engineering and be US Citizen or have permanent residency card.. Send resumes to hr@swiftengineering.com. AEi has an immediate need for a sharp electrical engineer (GPA > 3.6) with extensive knowledge of either OrCAD Capture/PSpice AND analog power circuit design (DC‐DC converters), RF tools (ADS) or digital simulation tools (Hyperlynx)! Flexible hours and excellent pay! AEi is an engineering services firm looking for someone to do various engineering tasks including ANALOG, DIGITAL, or RF circuit ANALYSIS AND SIMULATION, SPICE modeling of power electronics components, and hands‐on lab work. Please call or email ASAP if interested. Send resume to Charles Hymowitz at Charles@aeng.com or call 310‐216‐1144. The James Dyson Award challenges students and recent graduates of design, engineering and related disciplines to design something that solves a problem. The best invention internationally is awarded $45,000 in prize money, and their university receives $7,500. More details about the competition and how to enter can be found at www.jamesdysonaward.com. The competition is open for entries from February 18 – July 19, 2016. If you have any questions or would like any further information, please don’t hesitate to contact bailee.lauer@dyson.com. Morning Sign Out is a digital health company that looks to combine the best aspects of healthcare and technology. Candidate should know Objective-C and Cocoatouch framework. Flexible time commitment of approximately 2 hours/week. Your specific role would be a part-time internship that aids in the development of experimental clinical applications for iOS. Application can be found at http://morningsignout.com/recruitment/ and send resume to executivestaff@morningsignout.com. Internship: Mycofluidics Lab (Due: Apr 22) Professor Roper and the Mycofluidics lab is looking to recruit two undergraduates to work on image analysis projects. Students are expected to work in the lab for at least two quarters and work 6 hours per week on their REU project. The deadline to apply is Friday, April 22. Please send a copy of your resume, a short statement of your plans after you graduate from UCLA, and an updated “unofficial” transcript, DPR or DARS, to mroper@math.ucla.edu. Cal-Quake is looking for highly motivated engineering students for training in real world engineering. They are a construction firm that deals specifically and exclusively with earthquake retrofitting. Candidate must be proficient in AutoCAD. If interested, contact info@cal-quake.com. Project Engineers are responsible for assisting with seismic bracing projects. Project engineer should also be able to assist with tracking the cost and time associated with projects. If interested, contact ISATPM@isatsb.com. Students with backgrounds in geology, engineering, hydrology, and other related fields are encouraged to apply as well. Candidate would contribute to groundwater model development and analysis for the Sustainable Groundwater Management Act, operation of a unique riverbank filtration system for water supply, and maintenance of a large groundwater monitoring network. If interested, contact Andy Rich at arich@scwa.ca.gov. SummitWorks Client Solution Teams are specialized in project-based consulting, custom application development, and application maintenance & support. Candidate should have basic understanding of Sql, C#, .NET, JAVA, Java Script., Oops. If interested, contact Nitin Pandey at nitin.pandey@summitworks.com. This intern will, not only be involved in the development of the product design, manufacture, marketing, and launch of this new product but also be intrinsically semi-involved in the running of a business. This internship is unpaid but can be used towards school credits and obtaining work experience and an excellent reference. After a successful internship period, the position may become paid with huge room for advancement in the very near future. Applicant should have excellent knowledge of Solidedge, Solidworks, Pro engineer or Catia. Contact Suzanne Parker at lnfo@LNKInnovations.com with resume and contact phone number. This BIGDatA REU program provides funded learning and research opportunities to undergraduates to pursue future academic and career goals in Computing, especially in big data analytics for cyber-physical systems. The BIGDatA REU site homepage is http://www.cs.nmsu.edu/reu/home/. It is a 10-week opportunity (in summer) that includes $5,000 stipend, housing and meals, and round trip airfare to Las Cruces, NM. The Technical Writer has an active role in writing event and non-compliance deviation reports. The position requires handling and / or assisting in complex functions as they relate to the planning, development, arrangement, improvement, coordination and management of projects. The candidate must possess an advanced technical background, a rational and logical approach to problem solving, and well developed analytical abilities. Candidates should have Master or Bachelor degree in Chemical Engineering (preferably), Industrial Engineering, or Natural Sciences. Applicants should be pursuing Bachelors Program in Electrical Engineering / Electronics Engineering / Computer Science, Masters in Business Management. Interns are expected to send a copy of their resume, 2 passport size photographs, marksheets of completed semesters of the graduate program, marksheets of high school, and application form. Digital Media Academy is currently hiring Instructors and TAs for their summer program at UCLA which runs from June 27 – August 12. Courses run on a weekly basis Monday – Friday from 9am – 5pm. Applicants should have backgrounds in Computer Science, Game Development, and either Computer or Industrial/Mechanical Engineering. Staff members are only required to commit to the week(s) their assigned course is offered, along with an on-site orientation the weekend prior to the first day of camp. Apply online at jobs.digitalmediaacademy.org. Responsibilities include underwriting and analyzing potential acquisitions, including cash flow projection using ARGUS and/or Excel software, as well as gathering and evaluating economic, demographic, and real estate market data for potential acquisitions. B.A. degree required. Contact Elliot Weinstock at eweinstock@kearny.com if interested. Volunteers who join WindAid’s volunteer programs have the opportunity to build and install a wind turbine from scratch in just four weeks. The program offers housing with which includes a shared dorm room style, living room, kitchen, 3 meals per day (Monday – Friday), hot water and internet. The program includes transportation from Trujillo airport or bus station and an Orientation is organized with information regarding the program and immersion in the Peruvian culture and in the city. If interested, visit www.windaid.org. Centerfield is looking for entrepreneurial-minded individuals to fill a role as a Search Engine Marketing (SEM) Media Buyer. If Google Analytics, SEO blogs, and/or affiliate conferences are your milieu, they’d like to talk to you. SEM Buyers are responsible for buying and optimizing Google AdWords/Bing Ads accounts, analyzing the performance of campaigns, and strategizing to increase profits. Contact Amanda Arias at aarias@centerfield.com if interested. Candidate should have a doctoral degree or masters in biomedical engineering, electric engineering, physics, or related fields with a strong experience in programming, computational modeling, and experimental measurements received within the last 5 years. Theappointment is full-time at FDA in the Silver Spring, Maryland area. If interested, send a pdf-file containing your CV, a letter of motivation, and contact info for three references to Maria Iacono at maria.iacono@fda.hhs.gov. Duties will include equipment inventory, installation and configuration of software (e.g. e-mail clients, MS Office), deploying workstations and mobile devices, maintaining computer hardware as well as troubleshooting issues related to computers and peripheral devices. Initial training and introduction to Center IT policies will be provided. Must be able to work at least 10 hours per week on average. 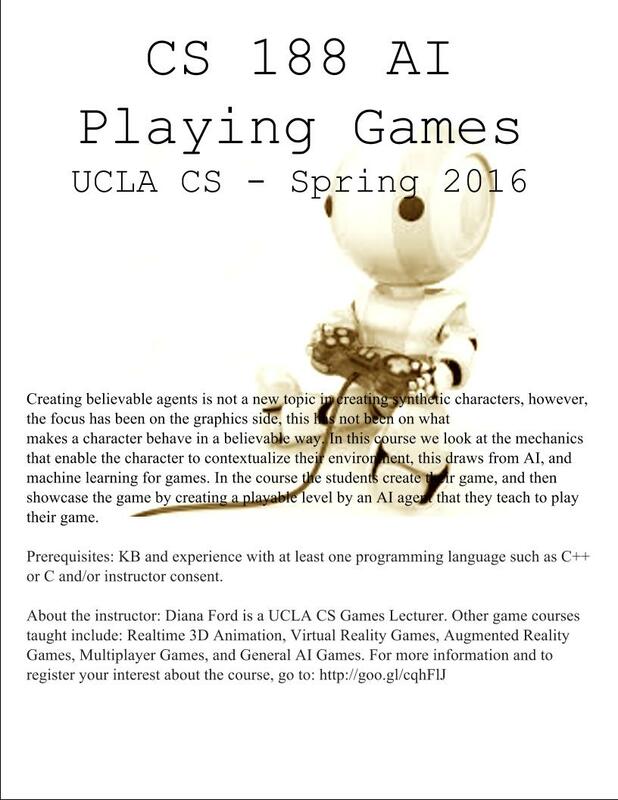 Contact masur@cse.ucla.edu if interested. As a QA Engineer you will work as part of a team responsible for delivering high quality NetApp software products. Through the application of systematic test tools and processes you will help deliver reliable, innovative storage and data management products. They are seeking full time University hires that are pursuing or possess a degree in Computer Science, Computer Engineering, Electrical Engineering or an equivalent degree with a tentative start date of May/June 2016. Apply at http://www.netapp.com/us/careers/university/ with requisition number 37224BR. Job: NetApp – Product Manager As a Product Manager you develop and manage product marketing programs to ensure continuity in product offerings. You develop and implement marketing strategies to respond to changing and /or competitive environments which may include product positioning, pricing strategies, and overall product positioning. They are seeking full-time University hires that are pursuing or possess a MBA degree with a tentative start date of May/June 2016. Apply at http://www.netapp.com/us/careers/university/ with requisition number 37228BR. As a Technical Marketing Engineer you work to create technical content for NetApp products and solutions that are targeted to Customers, Field Tech Teams and Partners. The engineer will work with Product Management as well as Product and Solutions Engineering on projects that support the company’s current and future strategies related to their specific area of technical expertise. They are seeking full time University hires that are pursuing or possess a degree in Computer Science, Computer Engineering or an equivalent degree with a tentative start date of May/June 2016. Apply at http://www.netapp.com/us/careers/university/ with requisition number 37229BR. The Advanced Technology Group is the innovation incubator within NetApp, responsible for researching, prototyping, and evaluating new ideas. They work directly with internal product groups to apply these ideas to existing and future products, thus having a directional impact on the Storage Industry. They are seeking full time University hires that are pursuing or possess a Master’s or PhD degree in Computer Science, Computer Engineering or an equivalent course of study with a tentative start date of May/June 2016. Apply at http://www.netapp.com/us/careers/university/ with requisition number 37230BR. As a Software Engineer you will work as part of a team responsible for participating in the development, testing and debugging of operating systems that run NetApp storage applications. As part of the Research and Development function, the overall focus of the group is on competitive market and customer requirements, supportability, technology advances, product quality, product cost and time-to-market. They are seeking full time University hires that are pursuing or possess a degree in Computer Science, Computer Engineering or an equivalent degree with a tentative start date of May/June 2016. Apply at http://www.netapp.com/us/careers/university/ with requisition number 37226BR. NetApp is looking for engineering students to be part of our engineering team designing or testing industry leading storage solutions. As part of NetApp engineering your challenge may be designing or testing components of our highly scalable clustered operating system that supports multiple storage protocols including FCP, iSCSI, CIFS, and NFS. NetApp’s Summer Intern Program is a 3 month summer experience that will provide you an opportunity to gain in depth knowledge about NetApp’s business and culture as you enjoy meeting with organizational leaders during lunch, network with your fellow intern colleagues at various social events, and present your hard work to NetApp executives and management. They are looking for summer interns to fill many Software Engineering or QA Engineering internship positions. Employment would begin in the summer of 2016. Apply at http://www.netapp.com/us/careers/university/ with requisition number 37234BR. As a Technical Support Engineer, you will provide entry-level technical support to customers, customer support personnel, and field support staff, focused on diagnosing, troubleshooting, repairing and debugging NetApp products. Candidate must possess a Bachelor of Science Computer Science, Electrical Engineering or an equivalent degree and pursuing a Master’s degree in Computer Science, Electrical Engineering or an equivalent degree with a tentative start date of May/June 2016. Apply at http://www.netapp.com/us/careers/university/ with requisition number 37235BR. Job: UtopiaCompression – Software Engineer You will be working closely with a group of Research and Development Scientists and Engineers to breath life into cutting edge algorithms by implementing them in embedded and PC systems as pertaining to Unmanned Systems, with real time performance expectations. UC manages and actively develops a variety of technologies in Machine Learning, Computer Vision, Networking, and Medical domains. Candidates should hold a BS/MS in CS/EE and be experienced in C++, Python. Send resume to: jobs@utopiacompression.com with the job title as the subject. Job: UtopiaCompression – GPU Software Engineer You will be working closely with a group of Research and Development Scientists and Engineers to breath life into cutting edge algorithms by implementing them in embedded and PC systems as pertaining to Unmanned Systems, with real time performance expectations. UC manages and actively develops a variety of technologies in Machine Learning, Computer Vision, Networking, and Medical domains. Knowledge of OpenCL and GPU computing is desirable. Candidates should hold a BS/MS in CS/EE and be experienced in C++, Python. Send resume to: jobs@utopiacompression.com with the job title as the subject. Job: SFPUC – Green Stormwater Infrastructure Specialist The Green Stormwater Infrastructure Utility Specialist independently conducts complex studies and analyses of construction documents, calculations, and stormwater management reports of proposed projects to ensure compliance with the San Francisco Stormwater Management Ordinance (SMO) and solve design problems, policy problems, and process problems that may arise during project review. More information about the qualifications, job functions, and how to apply are included in the attachment. If you have any questions, email Anna Owens at aowens@sfwater.org. Small and dynamic Electrical Engineering firm seeking two Electrical Engineer graduates for entry and junior level position. Knowledge of lighting/power distribution design a plus. Candidates should have Bachelor’s Degree electrical engineering and experience in AutoCAD. If interested, contact Carol at carol@eelean.com. Students with a technical background are offered an opportunity to work on projects involving cutting-edge technologies in diverse areas such as distributed computing, machine learning, NLP, analytics, big data, statistics, knowledge engineering, legacy modernization, security, information management, data privacy, cloud computing, testing, enterprise mobility, internet of things, open source, web services, android, mobile application development and artificial intelligence. Submit your application online at www.infosys.com/InStep. Applerouth Tutoring is currently looking to hire 8-10 new tutors in Los Angeles and the surrounding area. Applerouth tutors help high school students prepare for the SAT and ACT, as well as for high school and college subjects, AP exams, SAT Subject tests, and graduate exams. Compensation is $35-40 hourly, plus travel and regular wage reviews. Candidate should have excellent SAT and/or ACT scores, and have transportation. Visit https://www.applerouth.com/jobs/ and fill out online application. Interested in teaching mathematics? There is an info session on Thursday, February 18, 2016 from 3-5PM in Moore 3320 about becoming a math teacher. See attached for more information. RSVP (https://goo.gl/ZbGgfM) is appreciated to order the FREE PIZZA! If you have any further questions, please email the office at ugrad@math.ucla.edu. Hello All, We have two new gaming courses on offer in Spring 2016: AI Playing Games What you will learn: Machine learning algorithms/ Artificial intelligence for games using the new amazon engine, Lumberyard. Scripting: C++/ Lua scripting/ Visual scripting Prerequisites: At least one programming language Who can enroll: Open to all engineering students or instructor consent Applications: Robotics/ Entertainment/ Medical.Virtual Economies in Multiplayer Games What you will learn: Networking/Graphics/ Popular virtual economic theory algorithms to create a sustainable infrastructure for players in your game Prerequisites: At least one programming language or instructor consent Who can enroll: This course is only offered online and is restricted to graduate students. 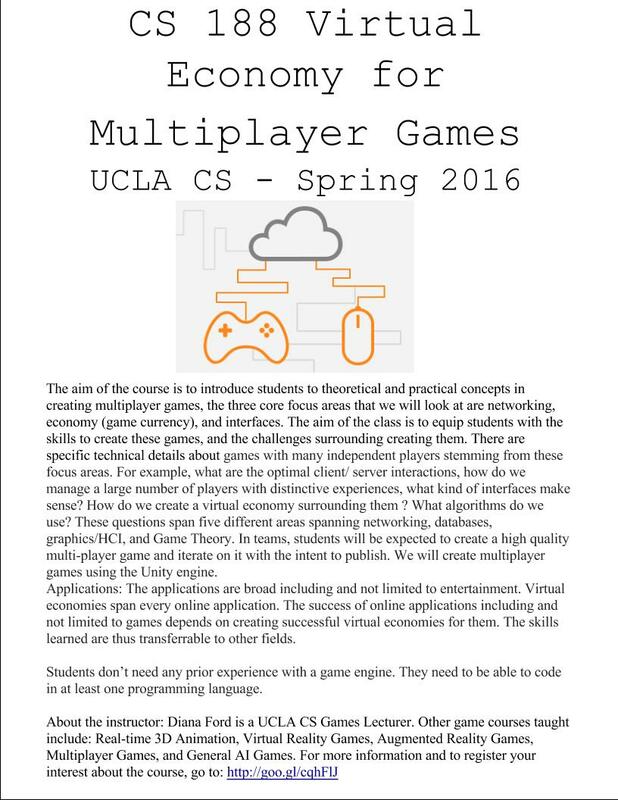 To enroll in the course please email me df@cs.ucla.edu. Applications: Software (online) applications for all fields/ EntertainmentAlso, please see attached flyers for detailed information.Please email me if you have any questions related to enrollment/ course content. Candidate should have experience with laboratory instrumentation, computer programming (e.g., MATLAB, C++, LabView), image analysis/visualization software (e.g., ImageJ, Amira, Analyze), computer hardware, or other engineering skills. Candidate need to have minimum 3.0 GPA. The Undergrad Intern will work with RIS scientists to apply their engineering and/or computational skills, learn about medical imaging technology, and gain valuable experience in a biotech research setting. The County of San Diego is now accepting job applications for the Land Use/Environmental Planner I-Noise Option recruitment, which is open to the public. This is an excellent opportunity for applicants who have a bachelor’s degree from an accredited U.S. college or university, or a certified foreign studies equivalency, in Engineering with an emphasis in acoustics, AND one (1) year of professional level experience in the field of acoustics as it relates to land use/environmental planning. Experience must be at the level equivalent to a Junior Land Use/Environmental Planner within the County of San Diego experience. Please visit the County’s jobs page to submit applications here. Candidate will participate in the development and testing of various networking applications and features on Silvus’ StreamCaster MIMO IP radios. Possible topics are IGMP multicast and snooping, VLAN, Dynamic Link Exchange Protocol (DLEP), Joint Architecture for Unmanned Systems (JAUS), Cursor on Target (CoT), video and audio streaming, etc. Candidate must be proficient with C is and familiar with Linux and TCP/IP networking. Send resumes to jobs@silvustechnologies.com with subject line ‘Embedded Software Intern’. This NSF Research Experience for Undergraduates Site at South Dakota School of Mines and Technology (SDSMT), the University of South Dakota (USD) and South Dakota State University, provides undergraduate students a chance to conduct cutting-edge research focused on security printing and anti-counterfeiting technology. The REU program is a 10 week summer research program (May 31 – Aug 5th) with research opportunities in Materials Science and Engineering, Materials Chemistry, Electrical/Computer Engineering, Chemistry, Mathematics, and Computer Science. There is a $5,000 stipend, and room and board is provided. Apply at SPACT-CENTER.ORG/REU. ACM SIGHPC and Intel are launching a new international program of graduate fellowships in computational and data science. Submissions open March 15, 2016. Interested faculty advisors and students can find more information on the fellowships, including a description of the fully online nomination process at http://www.sighpc.org/fellowships. Contact fellowships@sighpc.org. Enerwhere is the first company providing remote monitoring services to assess diesel generator efficiency in real-life conditions in the Middle East. The Enerwhere team is now working on the integration of the monitoring feature into the different components of the power systems and on the in-house remote display platform. The internship period will last from 4-6 months. Candidate should have understanding of database management and development (SQL and NoSQL are required), as well as knowledge of programming languages such as Python, PHP, etc. and data formatting in XML and use of JSON. Send CV to: careers@enerwhere.com with the subject: RME_Your University_Your Name. Design, build, and work with high performance compute algorithms for machine learning and data analytics. Work would consist of analyzing problems and designing mathematical/computational means of extracting useful information for machine learning (feature extraction). Send resume (PDF) and code sample with brief explanation (Plain text) to Aidan Plenert Macdonald at aidan.plenert.macdonald@gmail.com. Participants work in teams to complete rapid research projects in 10 weeks with guidance from NASA and partner science advisors. These projects demonstrate to partner organizations how NASA remote sensing imagery can be used in water resource management, disaster response, ecological forecasting, and other applications. Details about the internship and how to apply can be found at http://develop.larc.nasa.gov/ . The Summer term (June 6 – August 12) application window is now open until February 12th. For questions, contact NASA-DL-DEVELOP@mail.nasa.gov. This internship program is a great opportunity for inquisitive and motivated undergraduate students with exceptional aptitude for quantitative science majoring in Applied Mathematics, Engineering, Physics, Chemistry, Biology and Geology to work with some of the most notable scientists in the world while earning a modest salary. Applicants should be non-senior undergraduate students available to start at MPL in La Jolla, CA on or after June 1, 2016, and work the duration of the internship, ten consecutive weeks from the start date, for 40 hours per week at a salary of $14/hr. More information can be found on their website https://scripps.ucsd.edu/mpl/mpl-summer-internship-program. As Winter quarter approaches, Deloitte Consulting is gearing up for another great recruiting season! For January/February, they are focused on recruiting Juniors for internships and Sophomores for a conference. Kindly make note of these upcoming deadlines and events, and ensure that your application is submitted to both BruinView and careers.deloitte.com by January 15 at 11:59pm. Applicants will assess competitors by analyzing and summarizing competitor information and trends, utilize company CRM tool to farm existing and new opportunities, and manage sales cycle from quote to cash. Compensation is $35,000 plus commission structure and bonuses. If interested, contact Vaughn Minissian at vaughn@norchemcorp.com. Cambridge Mobile Telematics is seeking a topnotch iOS developer to help them build beautiful, engaging apps that help drivers improve their driving habits. Their mobile apps rely on innovative mobile sensing and machine learning technologies spun out of MIT. The apps are central to obtaining the sensor data and, more importantly, to changing driver behavior to make roads safer. Applicant should have ability to write high-quality, reliable ObjectiveC software. If interested, contact Jonathan Ledlie at ledlie@cmtelematics.com. BlueStamp Engineering is a 6-week summer program where high school students individually build engineering projects. BlueStamp, LLC is looking for independent, motivated, kind, and technical people to join their summer staff in all locations. Both are paid positions requiring staff to work together to assist students in creating their projects. This will include teaching engineering techniques and concepts, tools and safety, technical documentation, and troubleshooting methods. For detailed information about the program, please visit http://www.bluestampengineering.com. Lab Technician tests, troubleshoots, repairs, and calibrates electronic equipment containing a mix of discrete components and ICs. Applicants should be highly organized and have the ability to work in fast-paced environments, as well as knowledge on circuit boards and electronic equipment. Send resume and cover letter to jobs@solar-emc.com. The project engineer will be involved in the whole life cycle of projects and will be responsible for preparing functional design specifications, interfacing with clients to identify their application requirements, and configuring and tuning pipeline simulation, leak detection and other pipeline integrity management software. Applicants should have Bachelor or higher degree in engineering, physics or computer science. If you are interested in this position please apply via jobs@atmosinc. com. Sandia National Laboratories has multiple openings for full-time entry-level and experienced cybersecurity researchers to participate in efforts to secure government and critical infrastructure systems in support of the Department of Homeland Security and other government Departments and Agencies. Applicants should have Master’s degree in computer science, computer engineering. The successful candidate will plan, conceive, conduct, and manage research and development for Sandia’s customers and sponsors. The ideal candidate should be inquisitive, proactive, and have ability to work closely with chemists and biologists on new device design, formulation, and manufacture. The mechanical engineer will evaluate various technologies for product development, develop new technologies and update/improve existing ones, and prepare prototype devices. An MS or BS in mechanical engineering where additional experience in biology is an asset but not a requirement. Send resume to jobs@zymoresearch.com. BTU Engineers is looking for an intern to start immediately at our LA office. The candidate will be working closely with principal engineers on multiple projects, assisting in energy audits and commissioning process, reviewing drawings and specifications, participating in interdisciplinary meetings, and assisting in LEED projects. It will be paid internship with 20-40 hours per week. Email hr@btuengineers.com if interested. Responsibilities include performing research on advanced logic and/or memory devices using TCAD simulation, closely working with the TCAD development team to propose new direction of model development and creating and/or evaluating compact models for emerging nanoelectronic devices and perform circuit-level performance benchmark. Qualified candidate should have strong background in device physics and semiconductor technology, and MS or Ph.D. degree in EE or related fields. Email resume to collegeresume@ssi.samsung.com. The Application Engineer Intern will contribute memory and storage system research in the Memory Solutions Lab. He or she will join a team of experts in researching and developing innovative memory and storage system solutions that utilize existing and emerging technologies to add substantial value to storage systems. Responsibilities include implementing reuse distance profiler in commodity servers and/or embedded systems, analyzing data reuses to propose new architecture and storage systems for more efficient systems, and comparing workload characteristics. Qualified candidate should be pursuing an MS or PhD in Computer Science, Computer Engineering or related field, with focus on Computer Architecture and Systems. Email resume to collegeresume@ssi.samsung.com. The Machine Learning Intern will contribute memory and storage system research in the Memory Solutions Lab. The ideal candidate must have a strong understanding of image recognition, machine learning and CUDA as well as good understanding of computer architecture and storage systems. Qualified candidate should be pursuing an MS or PhD in Computer Science, Computer Engineering or related field, with focus on Computer Architecture and Systems. Email resume to collegeresume@ssi.samsung.com. Candidate will be part of the Storage Software Group at Memory Solutions Lab, which is responsible for the design and development of enterprise, data-center and cloud storage software, including device driver, caching, tiering, & storage virtualization. Candidate should have M.S. or PhD candidacy in computer science or equivalent. Email resume to collegeresume@ssi.samsung.com. The ideal candidate must have a strong understanding of computer architecture and storage systems and be able to implement data intensive applications on Xilinx Virtex FPGA development board. Qualified candidate should be pursuing an MS or PhD in Computer Science, Computer Engineering or related field, with focus on Computer Architecture and Systems. Email resume to collegeresume@ssi.samsung.com. R6 Students are specially invited to kickstart their careers in 2016 at the IEEE Online Career & Talent Expo. For instant access to all webinars, companies & resources click here to register select non-member and enter STUDENTPASS in the discount code. Build your future before you graduate by being a part of ITG’s 9–week paid internship! Responsibilities include designing applications and solutions to support the development and enhancement of their next- gen products. Applicants should be pursuing a degree in Computer Science, Engineering or a related technical discipline. Submit your resume to Careers@itg.com with Software Development Summer Analyst in the subject. Toptal’s Scholarships for Female Developers is a program to support and empower women aspiring to become professional software engineers. As part of its commitment towards forming the strongest core engineering teams and engineering talent network possible, Toptal is welcoming women from across the world of any education level to apply to win one of 12 scholarships over the next year. Winners will receive a $5,000 scholarship and weekly one-on-one technical training and mentorship from a Toptal senior software engineer to help them pursue their goals as future professional software engineers. Apply at http://www.toptal.com/scholarships. The UC San Diego Engineers for Exploration program is a 10-week full-time research experience that provides the unique experience of developing technology to drive future exploration. You will be working and collaborating with explorers and conservationists at organizations such as the San Diego Zoo, National Geographic, El Zotz Maya Archaeological Site, Hubbs SeaWorld Research Institute, California Wolf Center, and Scripps Institution of Oceanography. For more information, please visit: http://e4e.ucsd.edu. Application website: https://reumanager.com/efore/. Email jmatsuda[at]ucsd.edu if you have any questions. BCEGI is currently in search of an individual with an Engineering background, preferably at a Junior level whom is looking to grow with the company. Responsibilities include assisting in designing, developing and executing construction projects as well as determining budget, schedule, manpower and material and equipment requirements to execute construction project. If interested, visit http://www.ghjconstructioninc.com/company-overview.html or email Lisette Pakroo at lpakroo@ghjconstructioninc.com. Ideal candidate is a PLC programmer who is able to expertly program plant management and workflow systems for customized applications. Responsibilities includ provide on-site support for the testing of PLC/HMI systems for existing and new clients. Candidate should have B.S in Software Engineering disciplines. Contact Karineh Minissian at karineh@norchemcorp.com if interested. Position duties include performing field service for existing accounts, including upselling of products where applicable. Also, chemical engineering technician will generate monthly reports on field service, including performing plant surveys and quality audits. Candidate should have B.S in Software Engineering disciplines. Contact Karineh Minissian at karineh@norchemcorp.com if interested. Position duties include implementing and testing the company’s Plant Management Systems, and troubleshooting network and controlling issues that arise during installations. Candidate should have B.S in Electrical Engineering disciplines. Contact Karineh Minissian at karineh@norchemcorp.com if interested. Position duties include researching suitable solutions and estimating costs and timescales, and monitoring a product in use to improve on future design. Candidate should have B.S in Mechanical Engineering disciplines. Contact Karineh Minissian at karineh@norchemcorp.com if interested. Candidate assesses competitors by analyzing and summarizing competitor information and trends. He or she will also utilize company CRM tool to farm existing and new opportunities. Candidate should have Bachelor of Arts or Bachelor of Sciences. Contact Karineh Minissian at karineh@norchemcorp.com if interested. The Leading Engineering Education for the Future in Los Angeles (LEEF-LA) Project at Los Angeles Southwest College seeks to enhance the technical skills of local community members and workers so they can obtain employment and/or advance their careers in engineering.